You'll only find this months dog treat recipe right here in our monthly newsletter. Your dog will love this cold, sweet and fruity treat you'll need to have a back up batch in your freezer at all times. This frozen dog treat recipe is so flexible. Don't have blueberries? That's ok, use another dog safe fruit like strawberries, small bites of apple or even shredded carrots! If your dog needs to cut back on natural sugars, you can substitute the unsweetened applesauce with low sodium chicken broth. And if fruit isn't your dogs favorite, try sweet green peas instead. 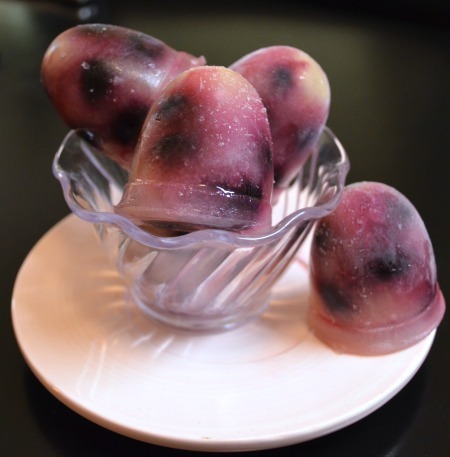 I used a brownie pop mold tray I had on hand to make these berry treats. But you can use any type of ice cube tray, silicone mold tray or small compartment container you have available to make these treats. Ok, let's get to the good stuff, the frozen dog treat recipe! In a glass measuring cup with a spout, stir together the applesauce and water. Fill each cup of the silicone mold with blueberries. About 5 berries per cup. Pour the applesauce mixture evenly between all 8 cups. Place the silicone mold on a small baking sheet for stability, and place in the freezer. Freeze for about 3 to 4 hours, or until completely frozen. Let the pops sit out for about 5 minutes and then turn the mold upside down and gently push out the pops. Store them in the freezer for no longer than 6 months. August 6th -12th - International Assistance Dog Week - This event was created to recognize, honor and raise funds for the beautiful dogs that provide support, assistance and companionship to those with physical or mental limitations. It is also important to raise awareness for those who train and prepare the next generation of assistance dogs. What can you do? Check out this list of Assistant Dog Week Event Ideas to help raise awareness and needed funds, and have fun at the same time. August 26th - National Dog Day - Here at DogTreatKitchen.com, every day is Dog Day! But, the 26th is an extra special day for everyone else. :) I think days like this are a time to reflect and actually thank your dog for everything he or she does for you. Think about it, does your dog greet you happily every time you come home? Does your dog cuddle up next to you, even if you just got back from the gym and are a little stinky? Does your dog do the happy dance when you give her that extra special homemade dog treat? If you answered yes to any of the above questions, take a moment to truly appreciate your dog and his role in your life. Then head over to the National Dog Day website for more ideas on how to celebrate this special day. Tested, Proven, Healthy & Delicious! There are a lot of free or very inexpensive dog treat recipe eBooks out there these days. But, are you really getting a good recipe? Are they healthy treats good for your dog? Will your dog even like the finished dog biscuit? I have taste tested every one of my dog treat recipes on multiple dogs (plus I taste test them, too!). If my panel of testers turn their nose up to a treat, I go back to the drawing board to make a healthy and delicious dog biscuit. You will only get healthy recipes that will actually work in a regular kitchen. So, what are you waiting for? Get to baking with tested dog treat recipes developed and written for beginner bakers. Check out my eBook 15 Easy Dog Treat Recipes with 5 Ingredients or Less! Or, make any day special with a celebration dog cake with my Dog Cake Recipes for Every Occasion.